Open wide and say RAWR. One of the things that makes the Jurassic Park franchise so memorable is John Williams’ score. The majestic music is one of the legendary composer’s most recognizable compositions. 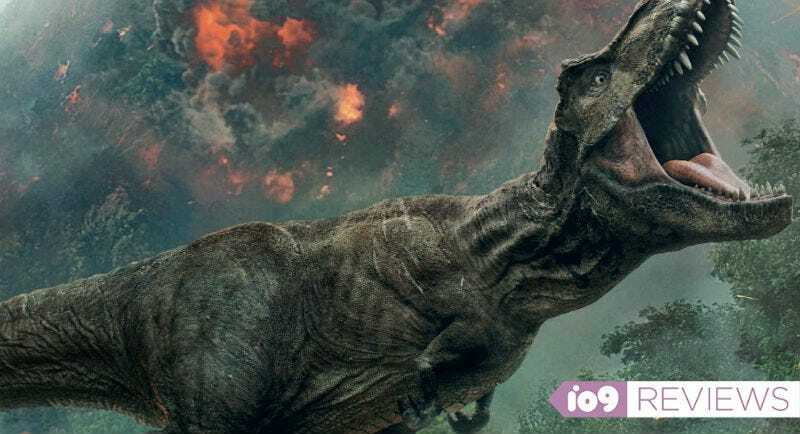 That score is teased, but never truly unleashed, in Jurassic World: Fallen Kingdom, which is also the perfect analogy for the movie as a whole. Everything feels held back and small. There’s never a moment worthy of that iconic music. Picking up three years after 2015's Jurassic World, Fallen Kingdom begins with the world in a moral quandary. A volcano threatens to kill all of the remaining dinosaurs in the world. Do we save them like any other endangered species? Or, with the knowledge of what they generally do to humans (in five movies, now, and counting), do we let them die? As the film opens, that debate feels like it’s going to be the focus. Later, it’s peppered throughout with varying degrees of success. It’s such an interesting and ripe discussion that when the film really lets the characters struggle with it, Fallen Kingdom is at its best, challenging expectations that big blockbusters can’t be about anything. However, while the idea is perpetually part of the movie, it usually takes a back seat to the main plot. That main plot is about Claire (Bryce Dallas Howard) and Owen (Chris Pratt) being hired to go back to Jurassic World to help capture the velociraptor Blue, the last of her species. They’re hired by billionaire Benjamin Lockwood (James Cromwell) who we’re lead to believe was John Hammond’s partner when Hammond first cloned a dinosaur. He wants Blue, and several other species, to be placed on an uninhabited preserve. However, unbeknownst to Lockwood, his associate Eli Mills (Rafe Spall) is going to sell the dinosaurs to fund genetic, weaponized dino-hybrids which he’ll sell to the highest bidder. Baby blue and Owen (Chris Pratt). Once Claire and Owen go back to the park, director J.A. Bayona begins to hit us with set piece after set piece. Some are large scale and epic, others are small and isolated, but they keep the film moving at a very rapid pace. The visuals are also quite impressive throughout, as one might expect when there are scenes depicting several dozen dinosaurs racing away from an active volcano. The problem is all of these set pieces, while entertaining, begin to run into one another. The big ones feel kind of small. The small ones feel kind of big. But few of them stand out in any major way. None of the characters really stand out, either. Claire and Owen basically just become slightly more self-aware versions of themselves. Mills is never an intimidating villain. Dr. Ian Malcolm (Jeff Goldblum returning to his classic role) is criminally underused. Lockwood’s importance to the franchise feels incredibly forced and, as a result, much of the logic behind the franchise gets undercut and subverted. A few things happen toward the end of Jurassic World: Fallen Kingdom that are likely to induce groans more than cheers. Maybe what Claire said in the first Jurassic World is right. Maybe we’ve just become so desensitized to seeing dinosaurs running around and eating people that we need something new and bigger to impress us. Unfortunately, Jurassic World: Fallen Kingdom isn’t that. A few cool moments and good ideas aside, it feels minor in the overall scheme of things. There’s no “Wow” to it—which makes me glad it never truly uses John Williams’ score. If it had, it would have undercut what this franchise can be, and may still be, but isn’t this time around.